and the difference in Germany’s overall education system. In particular, they were interested in talking to families like us that were dual national and wanted to find out how we were planning on educating our children. As you may recall, I also shared my more personal views on the topic of my kids and higher ed here on the expatkimchi blog. I feel that our attitude is more Korean than German or American. Our gut feeling right now is that our children will have more choices, options and doors opened if they study in the United States and have an American college experience. The choice will be made later, but if we don’t start saving now, that American door won’t be opened without financial hardship later. It’s in our mindset; as Korean parents who place a high value on education, we are compelled to save actively for the best education that money can buy. But, please, if you are an American university administrator, don’t make the assumption that all Koreans and all Asians are the same or have the same saving potential for an expensive private education. I say this because most university aid packages for minorities exclude Asians from applying and benefiting, and this sort of institutional exclusion is wrong and based on stereotypes. We had a hoot spending time with the two bright, young reporters that came to talk with us: Kirk Carapezza and Mallory Noe-Payne. The thought crossed my mind more than once, “Ooo, I would love to have their jobs!” I was more than happy to facilitate their story by introducing them to other American families through the American Women’s Club of Düsseldorf, my fellow German Way co-blogger Jay and help them gain access to our local elementary school. As tweeted, being interviewed by WGBH. Hear our interview and see the transcript in the blog post here. This is a link to the whole series which gives a good overview of the German education system for American listeners. 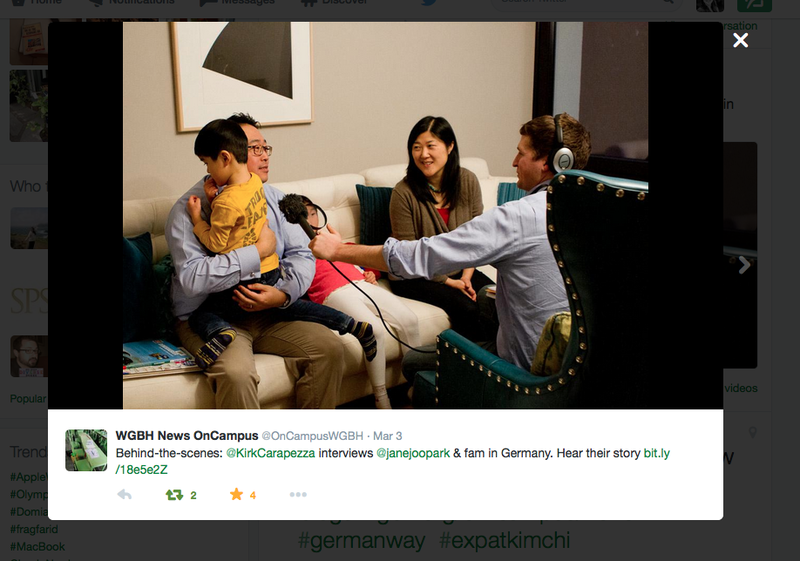 Tags: Asian American financial aid, college planning, German Way Expat Blog, higher education, Koreans and education, parenting, saving for college, WGBH, WGBH On Campus. Bookmark the permalink.